The startup company, Studebaker Motor Company, based in Arvada, Colorado, owns the Studebaker nameplate and is hoping to make motor scooters, cars, and more under one of the most recognizable nameplates in American automotive history. Studebaker is one of the most well-known names in American automotive, but has been relegated to the realm of collectors and restoration enthusiasts ever since the company closed its doors in 1966. The company produced some of the most innovative, thoughtful, forward-thinking vehicles in automotive history, such as one of the first all-electric cars in 1902 and some of the most fuel-efficient cars of the 1950s and '60s. The company and its name means different things to different people. 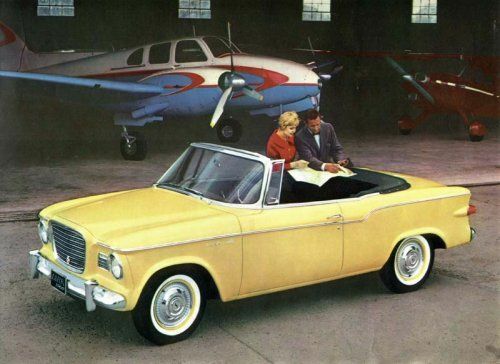 The Lark, pictured here in its 1961 form from Studebaker advertising of the period, was a fuel efficient and relatively popular car thanks to its fly-in-the-face attitude that turned away from the gas-guzzling monster cars of the Detroit 3 at that time. What it didn't have was enough selling power to keep the company in the black. Today, a little company in Arvada, Colorado wants to revive the Studebaker name and expand its nameplate to include not just cars, but scooters and alternative fuel vehicles as well. Studebaker Motor Company is a startup that has been looking for funding to continue developing its concepts and move them into production under a five step plan (outlined on their website) since 2010. They've managed to get through some of the roughest financial times in our nation's automobile industry's history and are continuing forward. "It is my earnest goal to create vehicles that are in some way reminiscent of the classic Studebakers, yet brought into the 21st century," says CEO RW Reed. The company has several concept vehicles, including the car they hope to launch with, the new Lark, which is reminiscent of the small cars of that nameplate, but styled to meet today's expectations for a small four-door hatchback in the compact or small segments. A Sport Sedan and pickup truck round out the automobiles on the startup's list. Also on that list are plans for scooters and motorcycles, styled with both futuristic street looks and old-school throwback road machine designs. The company has plans to produce electric, hybrid, and standard gasoline models. Although currently a startup looking to raise capital, the company is moving forward. Who knows? Perhaps this American legend will see rebirth. That is excellent news! It's the perfect time to revive a well-known brand that has enough nostalgia to bring in clients. I hope they will also work on an electric platform. There is a Studebaker pick up truck near me. I had no idea the company made them. They didn't make those trucks for very long, but they are some of the most distinctive of the period. The new Studebaker CEO says they plan to electrify their scooters and haven't developed, but hope to include hybrids and full electrics in their automotive as well. Those trucks actually look good compared to what I think were the goofy heavy handed ones back then. Good to hear about electric scooters and eventual car hybrids and electrics.